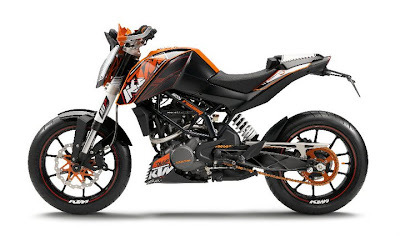 Austrian based leading motorcycle manufacturer, KTM Sportmotorcycle AG is all set to enter into Indian motorcycles market collaborating with Indian arm, Bajaj Auto. KTM-Bajaj Auto are jointly developing the new KTM Duke 125 in the Indian auto market. KTM has officially unveiled the production version of 2011 Duke 125 at the 2010 Intermot Show in Cologne, where it stood in public for the first time. Bajaj Auto would also intend to develop the new Duke 125 in the country along with the joint venture, KTM Sportmotorcycle AG. The new Ktm Duke 125 comes loaded with a fuel- injected four stroke single cylinder engine. The powertrain of this bike can expect to produce power output of 15.2hp at 10500 rpm and 12Nm of peak torque at 8000rpm. The Ktm 125 Duke is the first street legal bike of KTM, which aims to capture young and entry level riders. The suspension is supplied by 43mm upside down fork and rear monoshock from WP, both suspension giving 6.3 inches of travel. The new Ktm 125 Duke wheels has been developed with alloy wheels and single disc unit brakes in conjunction with Brembo. The fuel tank capacity of 125 Duke is around of 13 litters along with 2.5l in reserve. It has incorporated with 5 speed transmission system. However, The company has not yet officially announced the launch of new KTM 125 Duke in India. As per some sources, the new KTM Duke 125 is expected to be launched by the end of 2010 or early 2011 in the country with the attractive and competitive price tag of Rs. 1,00,000/-. The classy and stylish racer bike KTM Duke 125 would be available with exciting colors and shades. The Duke 125 might get tough competition with the same engine capacity bikes like Suzuki Slingshot 125, Honda Shine, Yamaha YBR, TVS Flame 125 and Bajaj Discover 135cc.